A wide swath of weather conditions has characterized the winter of 2018 into 2019 in the Northeast and Midwest. Though winter was nearly nonexistent through the first half of January, winter’s fury took hold at that point with heavy snows, a Polar Vortex, snow-melting temperatures and rain, more snow, and then more rain followed by cold. The result of this menagerie of messy weather is a lot of ice formation across crop fields, including those with alfalfa. Injury is most likely to occur on flat, heavy, wet soils and/or where stubble does not protrude through the ice sheet. 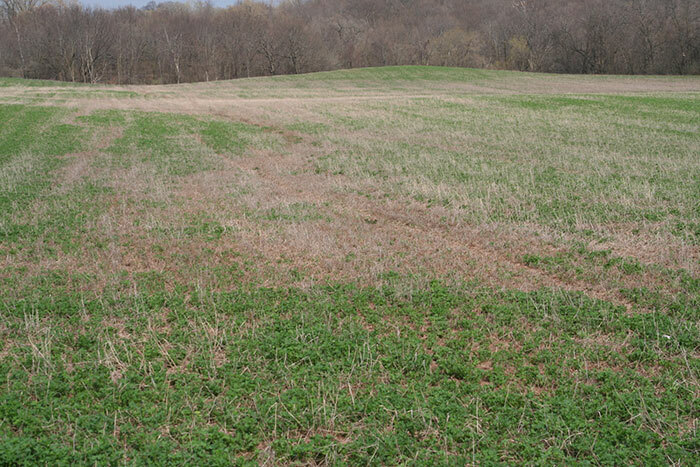 Winter cereals may be more susceptible to winterkill from long-standing ice than perennial forages such as alfalfa. The good news is that alfalfa plants have not yet broken dormancy and plant respiration rates are extremely low. Ice sheeting that occurs in early spring would likely be more damaging. Of concern, however, is the duration that ice has existed in many locations. There is little that can be done to eliminate the problem. Using a disk or rotary hoe to break the ice will result in more damage to both the implement and crop than if doing nothing. Applying fertilizer to melt large quantities of ice would require many tons per acre, and plants would probably die from salt injury next spring. The best bet is to wait and assess damage (or lack thereof) this spring and make the appropriate decisions at that time. There are plenty of other things to worry about aside from the ones we can’t do anything about.